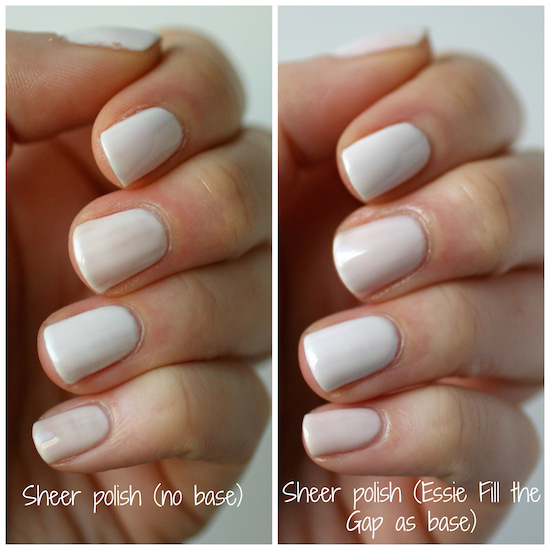 I've recently gotten a few requests to review Essie base coats, top coats and treatments. I honestly think this is a fabulous idea. As some of you may know, back in November I tried to put some Essie top coats head to head in a "Battle of the Top Coats" test, but I've only gotten half way through that experiment. I haven't had the time to sit down and swatch for multiple posts at once and get ahead of my blog posting schedule, which means I need to leave my nails clean instead of testing a top coat for a full week. I'm hoping I can finish that experiment soon and get that post up in January. In the meantime, I thought I would dedicate this post to Essie Fill the Gap. I've been using this base coat for the past 8 months when I hauled it in April and I feel I can give you a really accurate and thorough review. It claims to "visibly sculpt and plump nails" and "fill in ridges and conceal imperfections." It is also fortified with nutra-keratin and bamboo extract so that it is a ridge filler and protein treatment in one to make nails stronger while making them smoother (description from Essie.com). 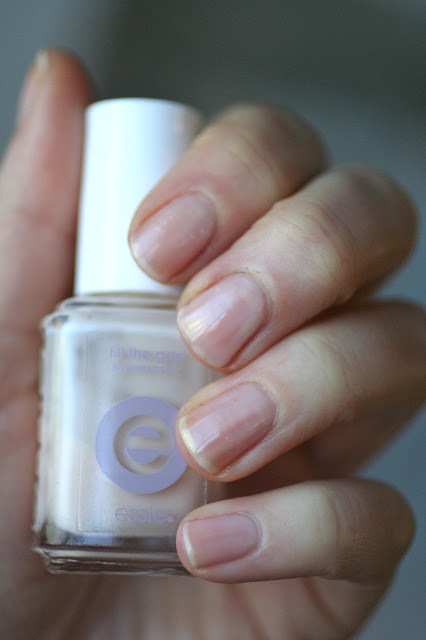 Before this treatment, I had used Essie's Ridge Filling Base Coat and loved it but I was experiencing nail peeling, so when I went to replace my bottle of Ridge Filling Base Coat I went for Fill the Gap instead. This treatment 100% delivers on it's promise to plump nails, visibly sculpt, fill in ridges and conceal imperfections. It puts this semi-thick base down that self-levels really well and when you apply polish on top you get a flawless finish. It's especially helpful for foils and chrome nail polishes that tend to highlight those imperfections. In the photo below I used Fill the Gap on two nails and no base on the other two with 2 coats of Essie's Penny Talk over all. The difference was night and day. The nails with Fill the Gap looked ten times better. It really helps to deliver that "mirror-finish" that you are looking for from a chrome or metallic nail polish. I know that you can "buff" nails to achieve this same finish, but because my nails can be brittle and are prone to peeling, I don't like to make them thinner and weaker than they already are. Fill the Gap protects my nails as well as giving me that smooth finish. Fill the Gap also has a slight milky-pink hue to it. The colour along with it's smoothing/plumping qualities really help sheer polishes to go on more smooth. Below is 3 coats of Marshmallow and Tuck in My Tux without base coat on the left and there's still a lot of streaks. On the right, I applied Fill the Gap first and then my 3 coats of polish. The finished look is smoother, shinier, more even and more opaque looking. Best of all, no streaks! When using Hubby For Dessert (sheer polish), Fill the Gap as my base helped to get a smooth and even application without streaks. When using Fiji (old version), a notoriously streaking polish, I got a much smoother final product with FTG as my base (pics comparing with and without FTG in the post). When using One-Coat Wonder polishes, I got a more sure-fire, opaque in one coat result with FTG applied first. When using Salt Water Happy, a great polish with an opaque creme formula that applies in 2 coats, I was able to get it opaque in one-coat instead with FTG as my base. So no doubt, this base really helps to smooth out nails and improve the performance of the polish that goes over top. This base coat can get thick quickly. It disappointed me quite a bit that it does this because Essie's Ridge Filling Base coat doesn't have this problem. In 8 months I have used half the bottle of Fill the Gap and I've already had to thin it out 2 or 3 times. The first time was probably a month after I first started using it. I really dislike when products thicken up like this because it becomes harder to apply a thin, smooth and even coat. As it gets thicker, it causes the coat you apply to be thicker. This means your base coat will not dry as fast and can also ruin your nail polish later on, because the top layer will be dry but the bottom layer is sliding around because it's still wet. This is a shot of how thick this polish is. I lifted up the nail polish brush to take these photos and it was in the air for a good solid 30 seconds or more and base coat never dripped off the end. 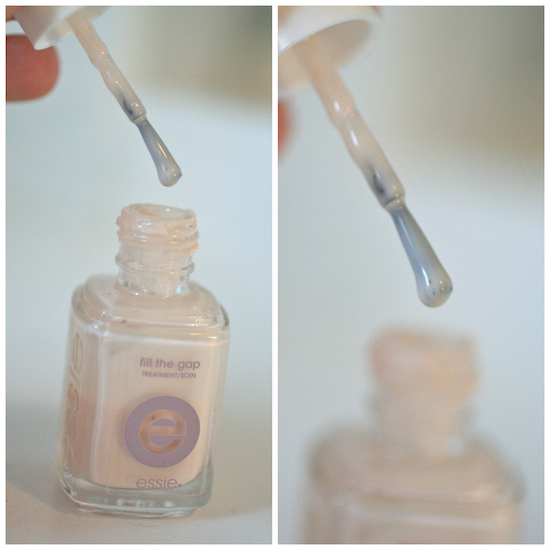 If you are going to buy Fill the Gap (or already own it) you'll need to have a bottle of nail polish thinner on hand. You can buy this at Sally's Beauty Supply or order it online if you don't have a Sally's near you. It doesn't need to be the exact one I have here, this is just the one I own. It can go by several names, so try searching for: nail polish thinner, nail lacquer thinner, polish restorer, rejuvenator, extender or reviver. As soon as Fill the Gap starts thickening up, add a couple drops of your thinner and shake it up to get it back to an easy to use consistency. Back to some more positives of this treatment/base coat. I feel like the brush is wider than Essie's usual brush, making it easy to get a full and even coat. Even though the formula can be a bit thicker, the wider brush really helps to apply it evenly. I also feel like the base coat does a good job of extending the life of my manicure. Of course I haven't done a head to head test with other base coats yet, but it really sticks to the surface of your nail and the finished texture is slightly rubberized so the polish holds well to it. This is not a pro or a con, but something to keep in mind when you use Fill the Gap is to make sure you clean off the top of the bottle before capping it. I don't always do that so I get a really hard build up of dried base coat around the rim of the bottle. This causes air to get in the bottle and make it thicken up quicker because the bottle won't seal as tightly when you close it. It also makes hard, crusty polish build up around the top of the bottle which can get into the base coat. When you apply it later, it can leave little chunks of those crusty bits on your nail which obviously won't contribute to a nice and smooth surface. You can see what I mean on my index finger below. I don't want to say this is a con because I felt like it was more of a user error on my part. I should be cleaning off the tops of my polish bottles before re-capping them. As far as building my nails up with protein and making them stronger? I don't know. After 8 months I still have peeling nails. This could just be my body chemistry or that I'm missing something in my diet (or that I don't drink enough water...which I don't). So this base coat didn't stop the peeling but neither has OPI Nail Envy or Orly Nailtrition, which are all treatments other people swear by. So the protein treatment in this base coat may actually work for you because some reviews on the Essie website said that it totally helped their nails. I do think this nail treatment by Essie is wonderful and there's no denying that it gives me an amazing looking manicure and resolves multiple different issues, but I do find the fact that it thickens up quite annoying and I don't remember Essie Ridge Filling Base doing this. Even though I really like this base coat, I will probably get Ridge Filling Base next time to avoid this issue (and also because I didn't notice a difference with the protein treatment on my nails). Have you used Fill the Gap before? What are your experiences with it? I've usted it and totally agree with the Pros. However, I found that it turned my nails yellowish so, I got the Essie Brightener Polish. Problem fixed. Currently I'm using the Butter London Base Coat and is really good too. Oh interesting. I've had some stains on my nails too, but I thought that was from me swatching without base coat. Hmmm, it may just be from this base coat. Thanks for your input. I've never even heard of Essie Brightener. I just googled it and I wish we could get that here! 3 years of salon gel manicures left me with short, thin, crumbly, peeling nails with blotches and gouges :(. With a bit of trial and error, the mission for total recovery narrowed down to a handful of products. Using an acetone free remover to start. A "Classy Lady" glass nail file really helped shape my raggedy nails without tearing them and making them worse. It comes with a carrying case which allowed me to obsessively smooth little rough spots from crumbling throughout the day in the beginning (really sad). After remover, two coats of Nailtiques were applied. Then two coats of Essie Fill the Gap followed by Sally Hansen Instanet Dri Top Coat in the red bottle applied DAILY. Fill the Gap not only filled the ridges and dips but made the discoloration less noticeable. Worn without any other color on top, Fill the Gap makes my nails look clean yet doesn't draw attention to them. Good thing because there were many gouges and rough spots on the nail surfaces from years of brutal buffing and scraping off stubborn bits of gel color. The daily top coat helped my home manicure last more than a week without chips. After 6 months my nails are almost fully recovered, most of the tops look smooth & shiny after I finish the manicure and I actually have to fille then to shape and keep them from getting too long :). I do thin all of the brush on products as needed but that is no big deal. It's a long road to nail recovery but worth the trip. Sometimes I long for those salon gel manicures: perfect nails for 3 weeks in less than one hour. But it just isn't worth the damage control.